Sometimes, when I crave for something sweet and decadent, it is by default I reach out to make my favorite batch of brownie. This is after all a no brainer considering how chocolate has that strong hold on most of us. But then, when I think of this honey cornbread I wonder why don’t I make this more often? It is moist, rich and definitely sweet! And it will hit you in all the right places. Let me just say that the texture of this cornbread is not like a regular quick bread but instead, it’s more dense and moist, just like a cake. So really, it should be called corncake. This is the sweet stuff right here. As you some may have notice, I have been away for a while. I am currently on vacation visiting my family and just having the best time ever. There has been a lot of laughing, hugging, talking, cooking and my oh my there’s been a lot of eating! After packing two pairs of jeans with me, I think I need to go out and get some new ones only this time, a size up! I’ve also just completed baking and decorated three wedding cakes for the very first time. I have been so stressed worrying about it and had many sleepless nights just thinking about how it would all turn out. I am now happy to report that everything went well according to plan and I couldnt be happier. Right now, I am just getting all my photos together for my next post so be sure to drop by soon. Thank you again for being patient and for checking in. This cornbread just looks amazing! The honey on top is gorgeous…I am home visiting family as well, it is wonderful and so full of food and laughter 🙂 I never want to go back to school. I’ve never had these but they certainly look very moist, sweet and yummy! I am a sucker for anything chocolate, but a change from time to time is sometimes necessary ;). Those cornbread squares look so very moist and golden! That is a naughty cornbread recipe! I love the addition of honey. Totally decadent. Boy, I’m so glad you’re back blogging! That last orecchiette recipe was starting to get to me…LOL. Can’t wait to see photos of those 3 wedding cakes you made, bet they were fab. These cornbread honey squares look utterly delicious, and you’re right, they do have a cake-like texture. Plus, I feel like making these for myself now! The cornbread looks enticing enough on its own but with that glistening honey drizzled on top – oh. my. Yummmmmm i love cornbread and this looks so delicious. Your cakes sound very exciting! Sounds like you’ve had a wonderful time with the family. BOY these look GOOD – what a great sweet treat! It does look so moist, and yes, like cake! I would love a piece of it, warm, dripping with melted butter! Enjoy your family and your vacation! Ooooo, it does look moist! I love cornbread with chili or a roasted chicken. Glad to hear you’ve been off enjoying your time with your family. This cornbread bread sounds great, I like that it’s dense and moist like a cake. I love how different this is, such a nice change from chocolate 🙂 I will definitely be trying this. I hope you have a great time with your family and can’t wait to see the wedding cakes you’re working on! I’ll take this over a chocolate baked good anyday! They look wonderful. Glad your wedding cakes went well! I am soooooooooo glad you are back. You and your blog were missed. This cornbread looks soft and and delicate and oh so good drizzled with honey! Sounds like you’ve been having a great time with your family! I’m glad you’re back, you were defintely missed! 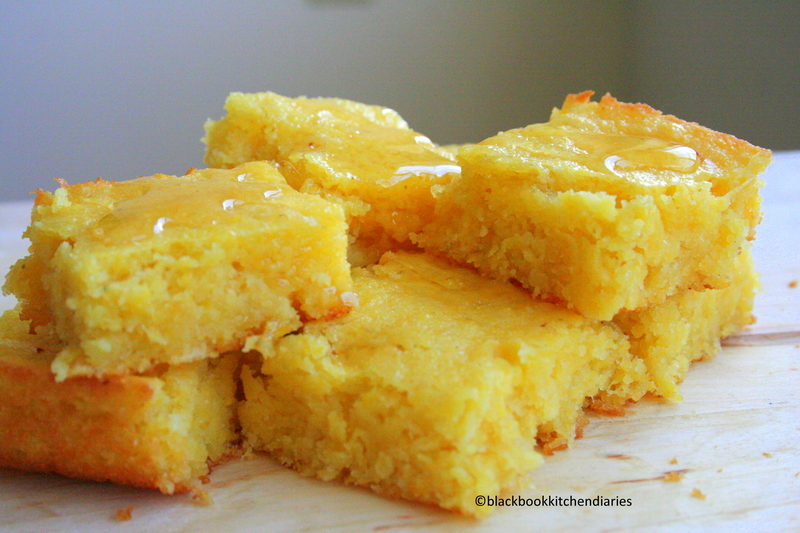 And this cornbread looks wonderful, that drizzle of honey on top has me hooked! This cornbread sounds delicious! I’ve always been a fan of cornbread, but this honey version sounds even better than the regular stuff. Yum! I haven’t made cornbread in such a long time even though I love it! Enjoy visiting with your family! Welcome back and glad to hear you’re enjoying the holidays! I love how bright these look – and how delectable they sound! Mmmm, cornbread gives me the shivers! This looks heavenly. So glad you had a wonderful time with family.This bread looks so beautiful with that yellow color.Love how healthy it is! Oh this looks like a very tasty cornbread..never had it with honey, but since I love both it should taste fantastic! Great photos, and have a Happy Monday sweetie! Thank you for stoppin’ by! That honey cornbread looks amazing! Made me think I can’t even remember the last time I had cornbread. Might just be time soon. on May 16, 2011 at 4:31 pm | Reply Platanos, Mangoes and Me! Wow! Three wedding cakes! That is awesome and reading through your blog I know you did an fabulous job! This corn bread is looking very tempting! This looks naughty indeed! I love it! I’m glad you are having fun on vacation. And congrats on the wedding cake. Someone just asked me to do theirs and I told them I just don’t think I would be able to stand the stress of it all. Nope. I’m pretty sure I would pass out! Gorgeous colour for a delicious cornbread! Enjoy a great holiday! Glad to hear you are having a lovely vacation. Congrats on making all of those wedding cakes – decorating and me don’t agree. This cornbread looks lovely – I think a dab of honey on top and I’d be away. Corncake. Awesome! I so want to eat this! Saving this for a baking day, thanks! That cornbread is the best cornbread, I have seen. Thanks for sharing. This looks perfect. I love honey with cornbread. It looks so moist and sweet. oh my. i absolutely adore cornbread. this is just glistening :). Ooooo a great change of pace for the sweet tooth. It looks so very good. It is good to see you again! And I think you should definitel call this recipe Honey Corncake. Congrats on pulling off the wedding cakes…you are definitely talented in that department. And three wedding cakes – congratulations! AND the cornbread/corncake looks heavenly. With those photographs, I can practically smell the heavenly bread-cake and honey….yum. 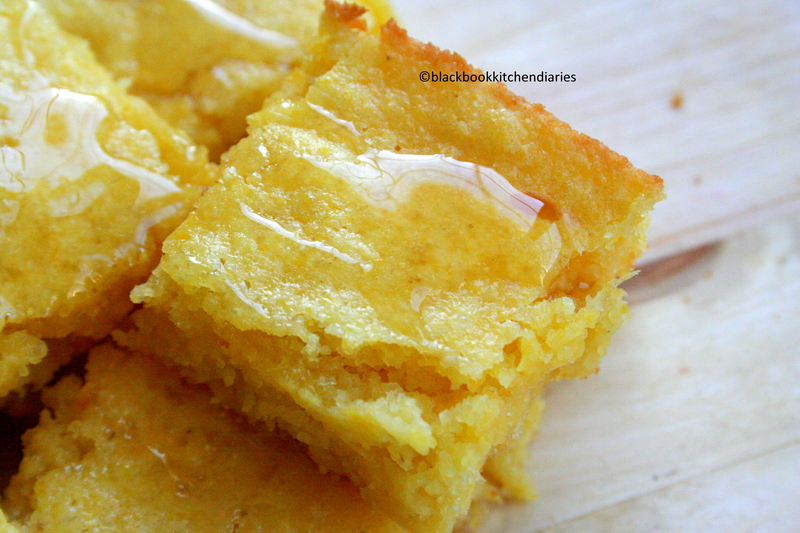 I love lightly sweet dishes like this honey cornbread. It fits the bill for so many different cravings! your cornbread looks so good.. it’s one of my all time favourite food. OH my.. I have been craving corn bread.. but honey.. I’d love to try your recipe.. I hope you are well, and have a fab weekend!!! I HAVE to make myself some cornbread. It’s just not eaten where I’m from, but every time I see it I drool. Can’t wait to try some for real when I go over to America in 2 months! Honey cornbread is actually a favorite of mine, too…but yeah, haven’t had it in forever. This versions looks so amazing…I may need to make a batch today. wow superb looking bread with the honey glistening on the top! Mouthwatering yum! That certainly looks cakey and delicious. Just going to check out the recipe. Yummy corn bread. Love the way you described it, bread with caky texture.